Golden Christmas. Those are the words that spring to my mind when I think of Christmas in Budapest. 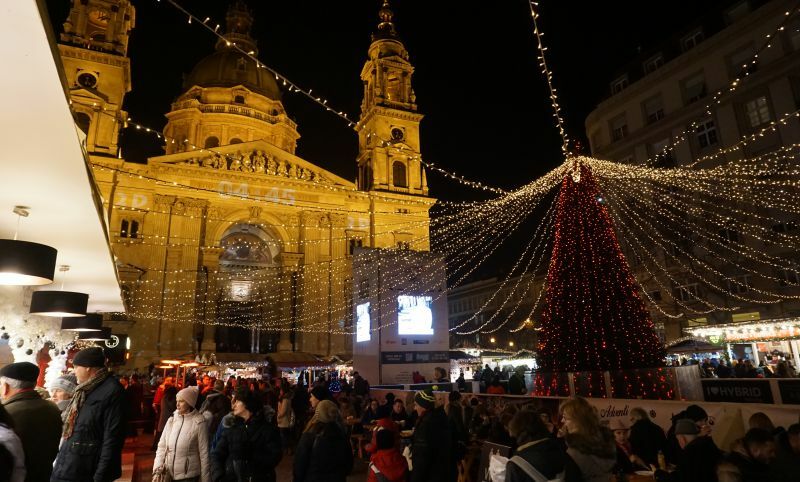 The capital of Hungary is abounding in Christmas festoon lights and golden illuminations. If you’re looking for romance, traditions, and gifts, it is definitely a place to visit. 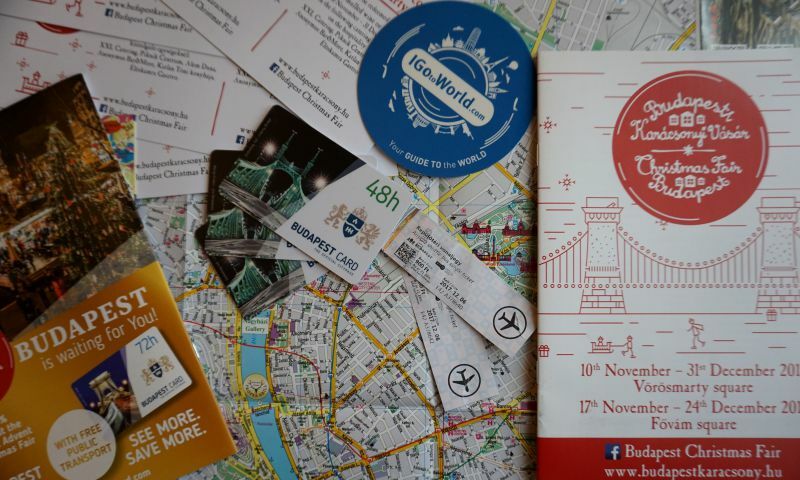 The IGotoWorld team came to Budapest during the Christmas holidays of 2017. We only had two days – 6th and 7th of December. 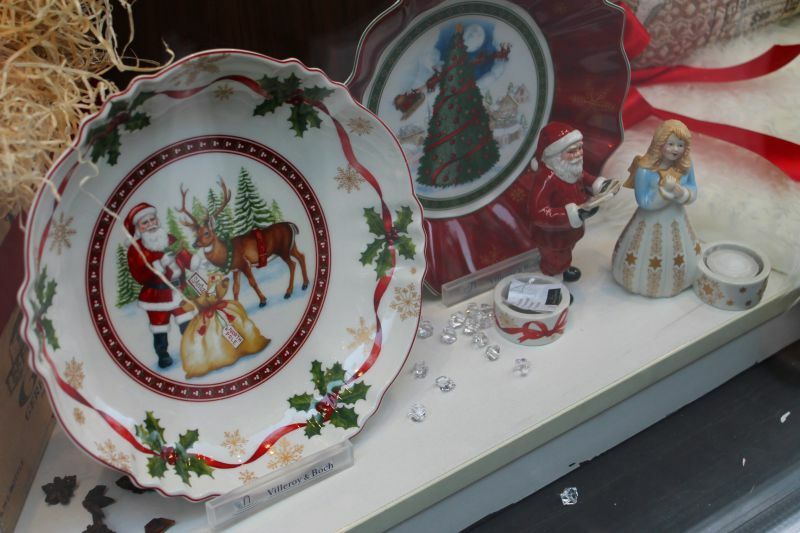 We have met lovely people, brightly decorated city and a real festive atmosphere. 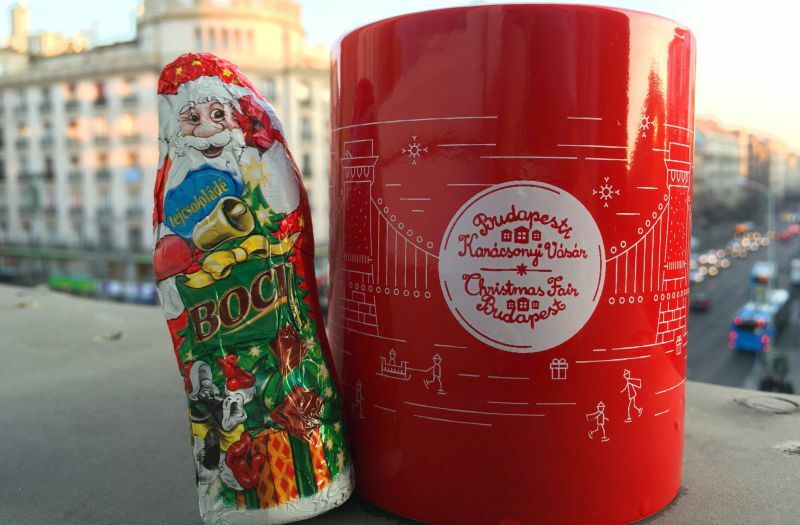 I cannot but share advice with you on why and how to celebrate Christmas in Budapest. And, of course, lots of photos of Budapest at Christmas. 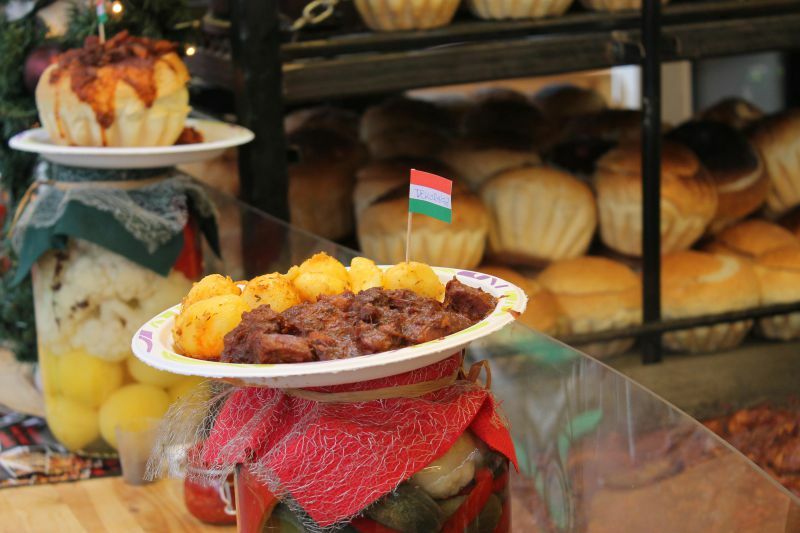 There are two main locations where the fair takes place: Vörösmarty Square and Budapest Christmas Market by Basilica. Vörösmarty Square is a pedestrian area and is filled with food and souvenir stands during the Christmas time. 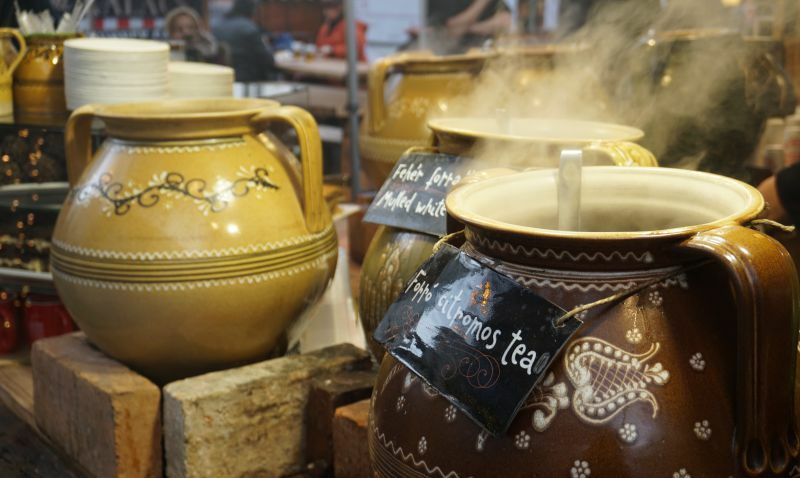 ...and fragrant mulled wine – that’s what is going to make you feel better after a walk through the city and replenish your energy for another one. ...and all of that goes with potatoes, vegetables, rice. Nevertheless, vegetarians have something to eat as well. 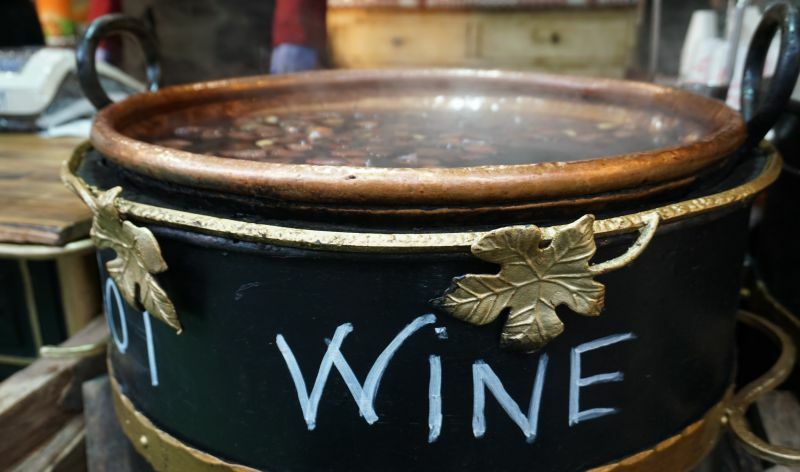 You should certainly taste some hot wine too; it will warm you up in no time. Tables and benches are set right on the square - just what street food fans need. 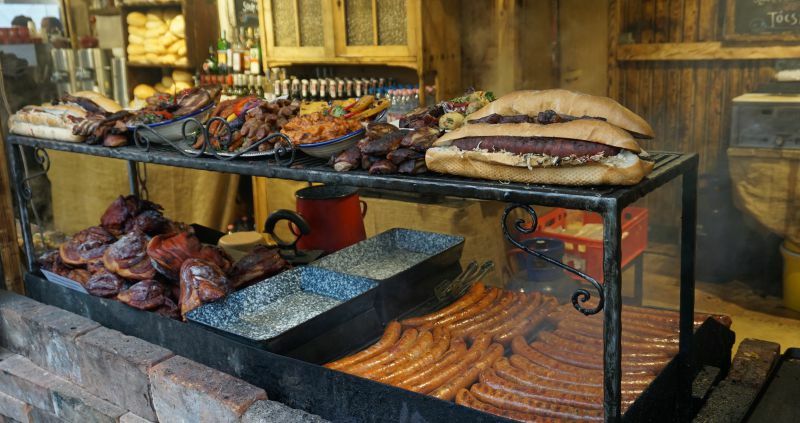 ...cheese, sausages, tablecloth with traditional Hungarian patterns, foie gras, etc. A unique gift can be bought in one of the oldest and most famous European coffeehouses called “Gerbeaud” which has been open since 1885. Special sweets are being made there for Christmas. Musical performances are organized on the square in the afternoon, especially on weekends. 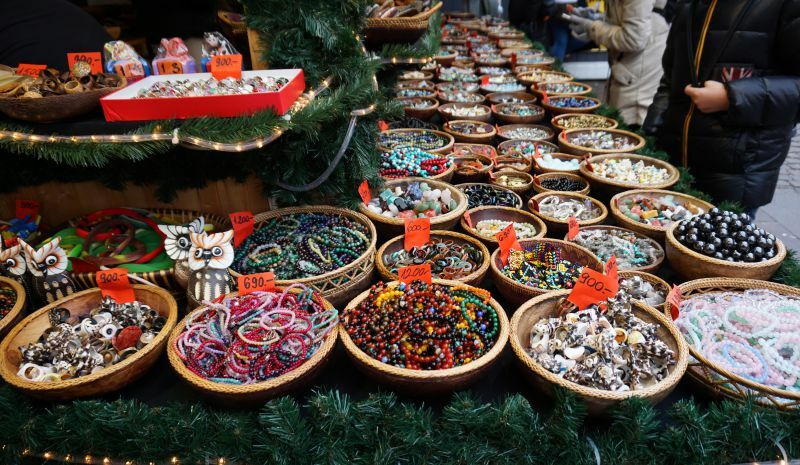 The tradition of setting up a Christmas fair on Vörösmarty Square dates back to 1998. Fair's opening hours. Christmas fair on Vörösmarty Square will last in 2017 until 31st of December. Souvenir stands will be open until 24th of December. 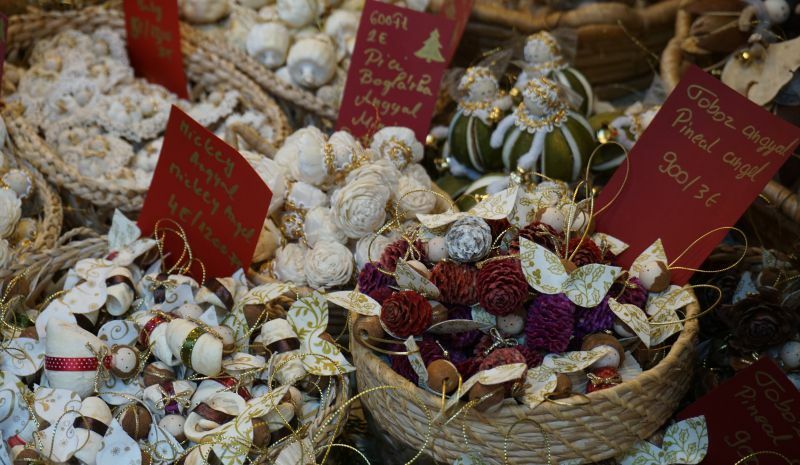 This year Christmas fair on Vörösmarty Square was opened from the 10th of November. It usually is open until 10 p.m. However even after that time you can find restaurants and bars where to eat or drink. Take the subway (yellow line M1) to the Vörösmarty Square stop. Take a tram №2 to the Vigado Square stop, then walk two blocks of Vigado street. Take a bus №16 to Deák Ferenc tér subway station, walk one block down the Harmincad street, then turn left to Vörösmarty tér. Walk on foot – if you’re at Pest’s center and have enough time, allow yourself to wander through narrow streets, one way or another you’ll get to Vörösmarty Square. 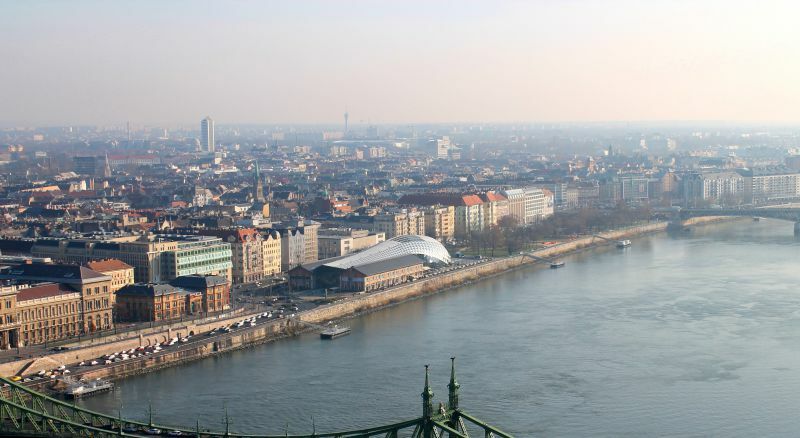 For better navigation: the square is located two blocks away from Danube river, practically in-between Elisabeth Bridge and Széchenyi Chain Bridge. 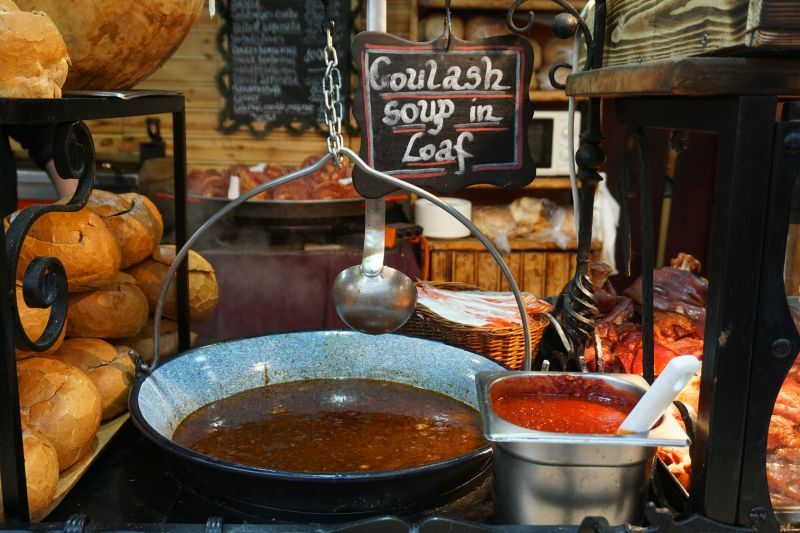 The market is held near St. Stephen’s Basilica, on the square that goes by the same name. It is 10 minutes away from Vörösmarty Square. At the center of St. Stephen's Square a rink, which is free for kids under 14 years of age, surrounds a Christmas-tree. 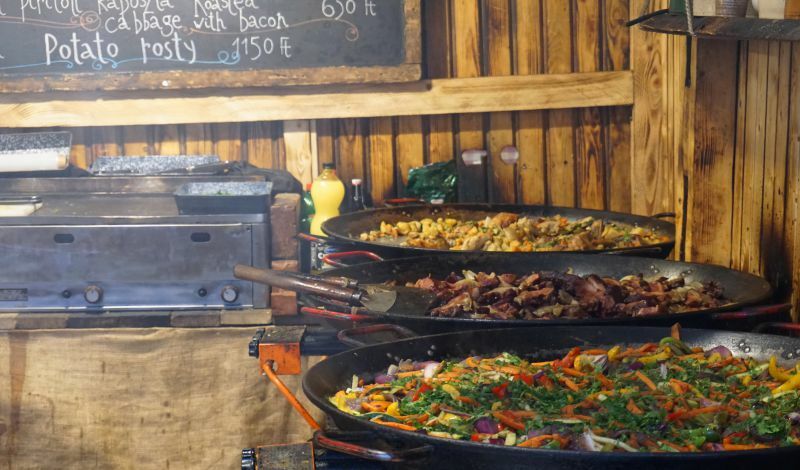 Souvenir stands and food-courts, similar to those you’ll see on Vörösmarty Square, however, this was the only place where we could find the traditional Hungarian food, which locals encouraged us to taste. 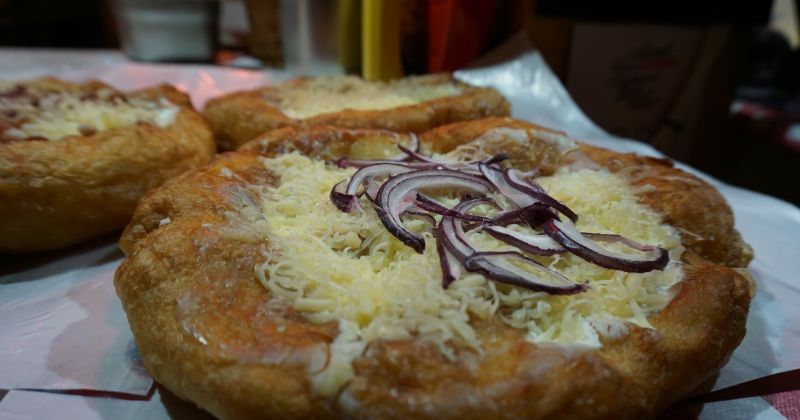 The dish is called “Lángos”, it is a fried bread with cheese and onions. 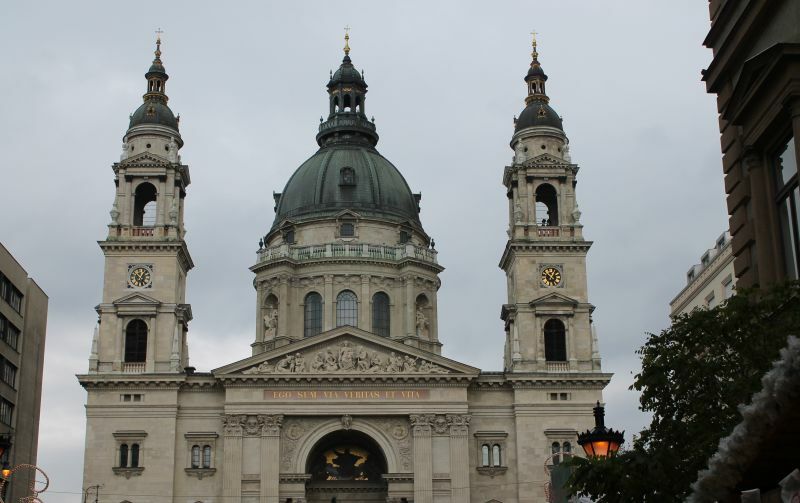 Just like in other churches, St. Stephen’s Basilica arranges organ performances, charity concerts, you can even hear a choir here. It goes without saying that the church should be visited at Christmas mass time. This is a special evening that fills hearts with warm and faith. 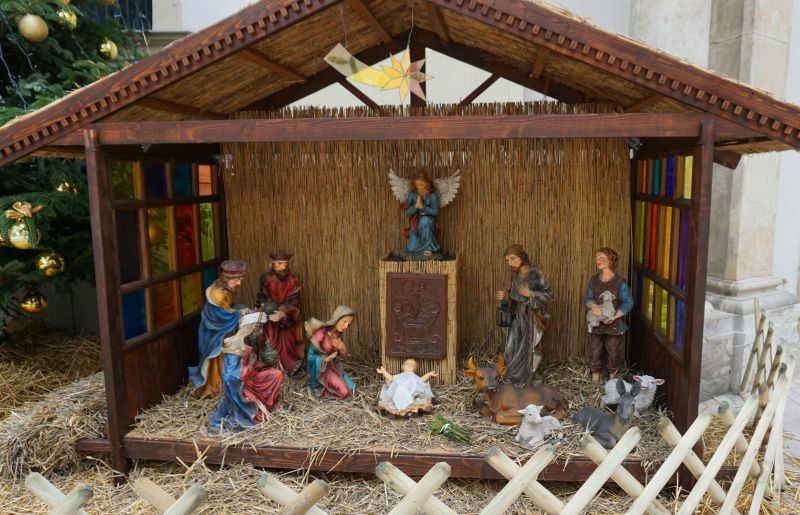 Next to churches you can often see a nativity scene. Piece of advice. St. Stephen’s Basilica is the best to come to in the evening. It will surprise you with the 3d projections on the building. It looks fascinating! And it will definitely create a Christmas atmosphere. We were completely bedazzled right from the start. Dates of the market: from the 24th of November 2017 till the 1st of January 2018. My advice is to get to Széchenyi square. It can be found by the river Danube near Széchenyi Chain Bridge, which, by the way, magnificently glows green in the evening. As a matter of fact, follow this route in the evening time to see festoon lights light up. You can get to Széchenyi square if you take buses №16, №105, №15, №115 to the Széchenyi tér stop. You can also ride by the tram №2 to the same stop. Then you have to walk to Zrínyi street, where you’ll find St. Stephen’s Basilica at the end. The place commands a wonderful view of the church. 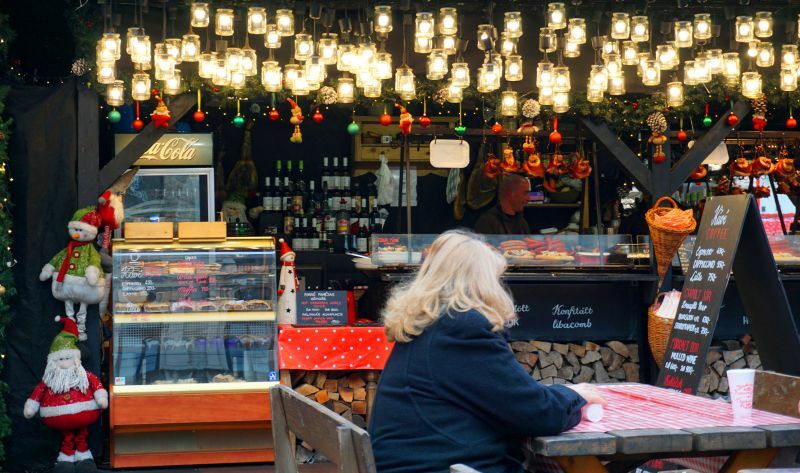 The further you go, the more festoon lights and Christmas stands you’ll see. There is a much convenient route, actually. Basilica has a bus stop called “Szent István Bazilika” right next to it, where you can catch a bus №9. Here you’ll see subway stop “Bajcsy-Zsilinszky út,” which is a part of yellow line M1. It would seem that Ferris wheel can’t really offer a good enough view of the city, but at the highest spot (65 meters in the air) you can enjoy a scenic overlook, in evening in particular – just the time when Budapest is covered in golden light. You should be able to see clearly St. Stephen’s Basilica as well as the center of Pest from here. 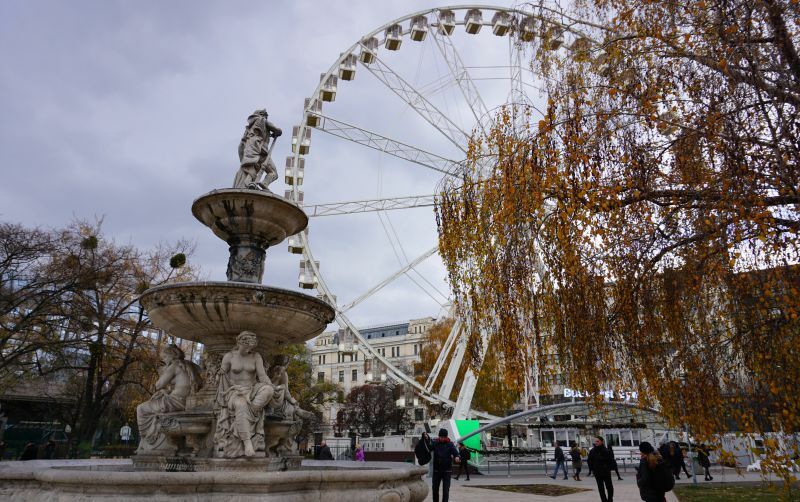 How to get: Budapest’s Ferris eye is located on Erzsébet Square, Deák Ferenc tér subway station is right next to it. Buses №15 and №115 passes through the Erzsébet tér station, and buses №16 and №105 - József nádor tér station. Price: the ticket costs 2400 Ft.
Budapest can offer lots of bathhouses. I'd like to tell you about two most interesting: Szechenyi Bath Gellert Bath. 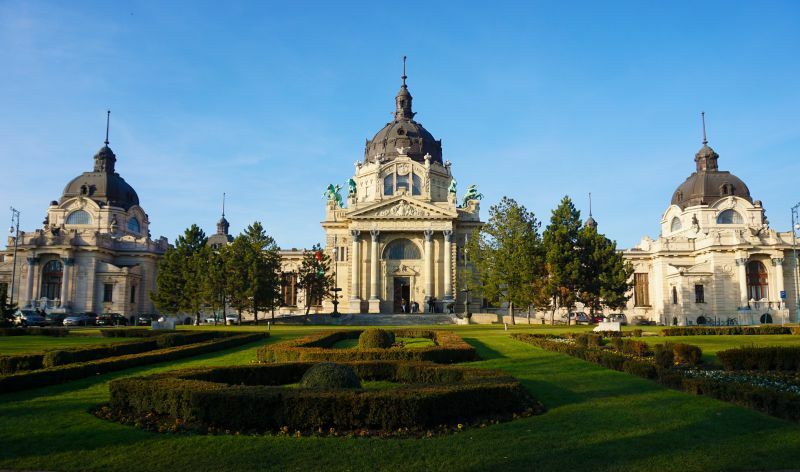 Szechenyi Bath is, with no doubt, the most known. If you have never spent time at the public bath, you should definitely visit this one. At least just for a check by “I was at the most renowned bathhouse in Budapest.” Thermal water pool is a real treat in frosty winter evening as it can help you relax and even make you feel younger. A high number of indoor and outdoor swimming pools is astounding. This how the building looks from the outside. And here’s a look from the inside. Price: the ticket cost ranges from 4600 Ft. to 5600 Ft., depending on the day of the week, time and changing room. Thus price for evening weekend ticket with private changing booth will cost you 5300 Ft. Opening hours: from 6 a.m. till 10 p.m. Some pools are open till 7 p.m., outdoor hot pool – till 10 p.m.
How to get: the most convenient way is to take the subway to Széchenyi fürdő station, which is on the yellow line. 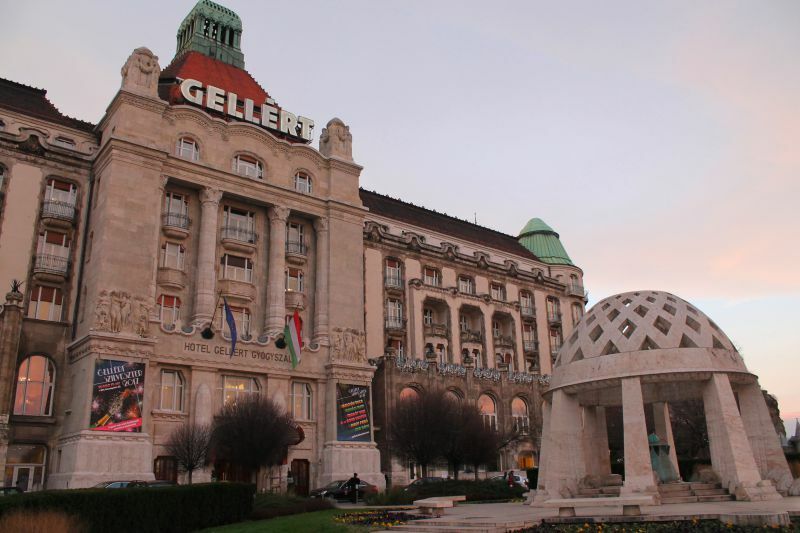 Another bathhouse worth visiting is at Gellert Hotel. It’s not as big as the previous one, but much fancier. Just look at Rayan Gosling’s photoshoot in the bathhouse “Gellert”! Price: 5300-5900 Ft. It’s best to buy tickets in advance during the Christmas time. 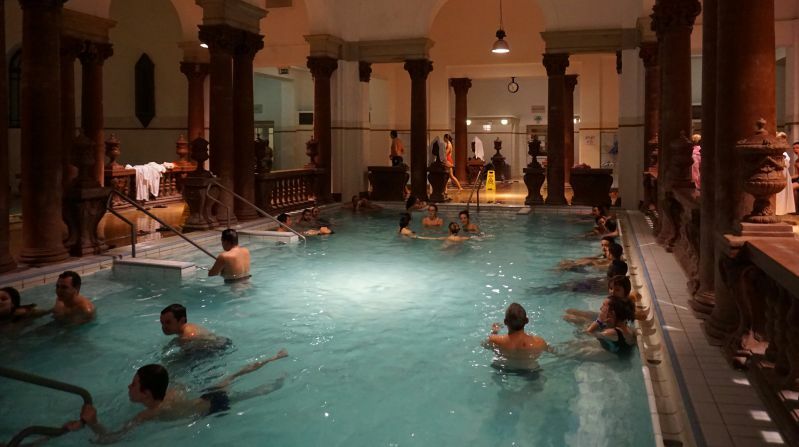 Opening hours: from 6 a.m. till 8 p.m.
How to get: bathhouse “Gellert” is located near Szabadság híd in Buda. Trams №19, №41, №47 include this place to their route and some other trams stop by the Szent Gellért tér. In Budapest, there are two open skating rinks, which are definitely worth visiting during the Christmas holidays: an ice rink in the City Park (Városliget) near the Heroes Square and an ice rink near Budapest Whale (Bálna complex). The skating rink in Városliget Park is one of the largest in the city. 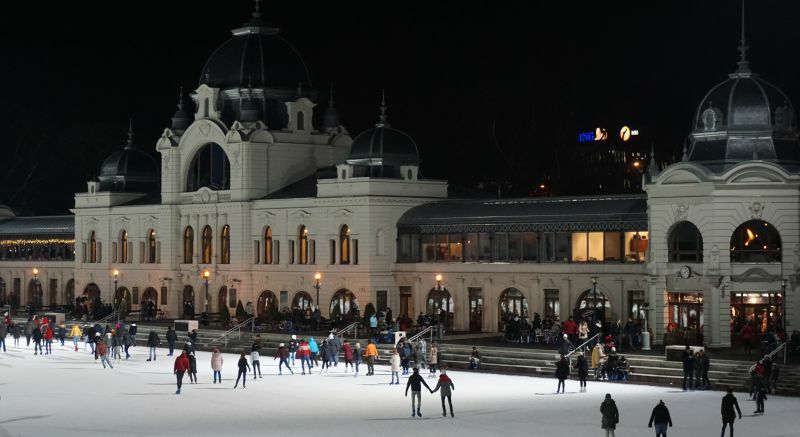 This ice rink is often included in the lists of the best places for Christmas in Budapest and even Europe. 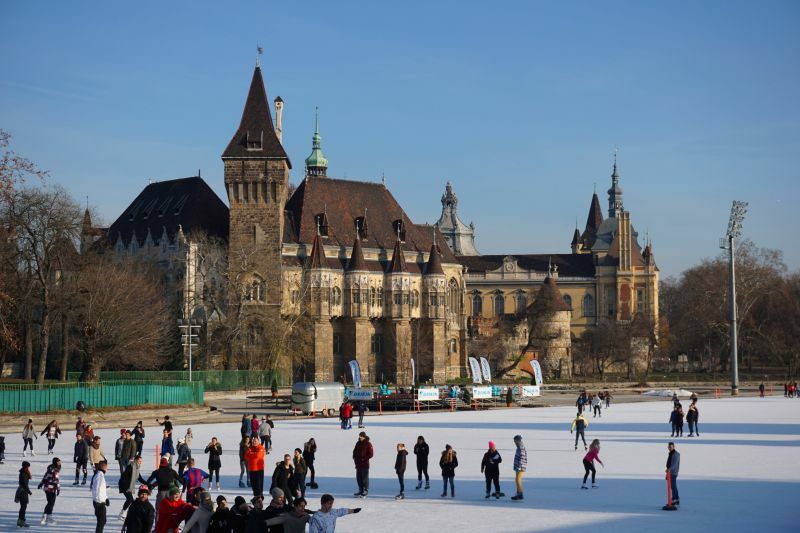 The Vajdahunyad Castle looks incredibly beautiful – right next to it the skating rink was opened. By the way, in the summer time, the skating rink turns into a pond. It's beautiful in the daytime and in the evening. Here people often come simply to skate or celebrate a birthday with friends. Cost: on weekdays the ticket costs 1000–1500 forints (full day), at the weekend – 2000 HUF (full day). Rent – 800 forints an hour. Opening hours: Monday to Friday from 9:00 to 13:00 and from 17:00 to 21:00. On Saturday and Sunday – from 10:00 to 21:00 and 20:00 respectively. Break: from 14:00 to 16:00. The skating rink does not work on 24 December. On the evening of December 31 and the morning of January 1, the ice rink is closed. How to get there: the ice rink in the City Park is located next to Heroes' Square. There are two metro stations: Hősök tere M and Széchenyi fürdő. 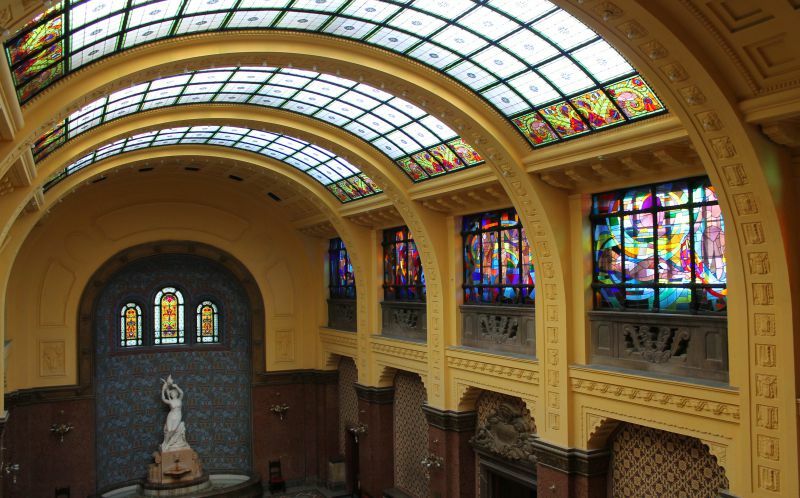 Nearby, you can find the famous "Széchenyi bath". Views from the ice rink near the complex Bálna are very beautiful – on the Danube and Buda district. The complex Bálna is very well seen from Buda – it is a modern building resembling a whale (in the Hungarian bálna it is a whale). 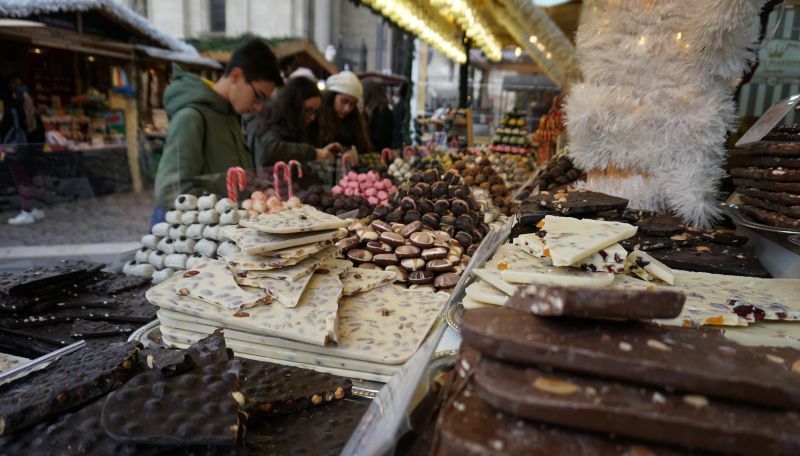 In addition, Christmas market with many delicacies and other attributes of Christmas is organised here. Cost: free admission. Renting skates costs 1000 forints for 3 hours. Working hours: from Sunday to Thursday from 10:00 to 22:00 with a break for lunch. On Friday and Saturday the skating rink is open until midnight. On Monday, the rink does not work. On December 24, the ice rink is open until 14:00. On December 25 and 26, on January 1, the ice rink is closed. On December 31, wait for New Year's party. How to get there: the nearest metro station is Fővám tér. You can take the tram number 2 to the stop Zsil utca. They say that you have to do the most memorable thing before you leave. I’d say, an evening tram ride around the Parliament Building can make your Christmas in Budapest complete. You need to take the tram №2, that drives along Pest’s riverfront, to carry this out. Behind the Parliament Building, you’ll see the final stop Jászai Mari tér, from where lays your way back as well. At this point, you will have a stunning panoramic view like this. 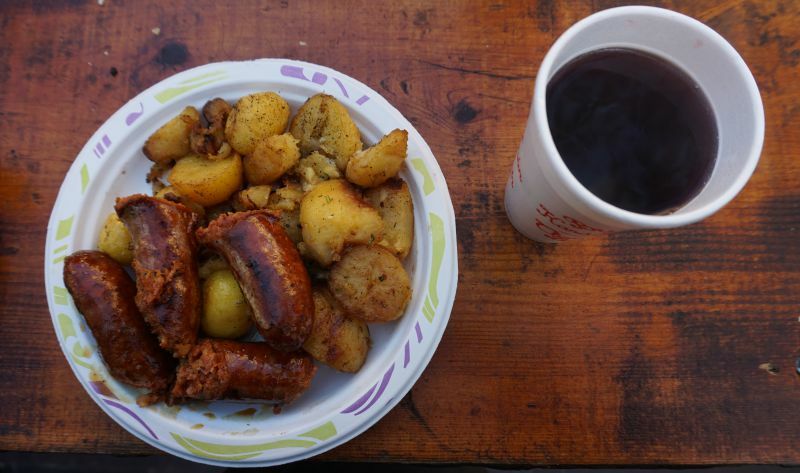 Mulled wine - 600 (2dl)/900 (3dl) Ft.
Fried sausage – 1950 Ft. Bread stuffed with fried potato – 650 Ft.
A lunch like this will cost you around 3500 Ft.
Costume jewelry – 500-1000 Ft. Souvenir cup – 1000 Ft.
Chocolate sweets – 500–5000 Ft.
A public transport ticket for one trip – 350 Ft.
24-hour travelcard is used to travel around Budapest by public transport and costs 1650 Ft.
Budapest card 24 is a card for tourists that can be purchased at tourist information centers and via Internet, in which case the card is shipped right to the hotel you’re staying at. It provides many advantages, including free transport, free admissions to many museums, bathhouses, free walking tours and some discounts for food and souvenirs. It costs 5500 Ft. for 24 hours, and 8500 Ft. for 48. If you are an active tourist and visit lots of places, then you will likely want to purchase a 48-hour card. 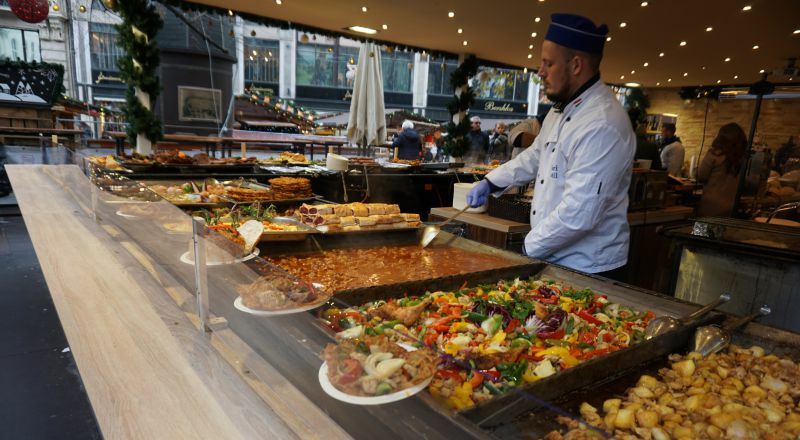 How restaurants and cafes work at Christmas in Budapest: as a rule, restaurants work at Christmas, but with a special menu and you are well advised to book a table in advance. The time of work depends on a restaurant. Some restaurants and cafes are closed on the 24th, 25th, 31th December and 1st January; other restaurants work, but until a certain time. Where to stay in Budapest: the number of hotels in Budapest is endless. From budget hostels to five-star hotels with a view of the Parliament building. There are also many options to rent an apartment. We stayed at the Astoria Hotel – cosy, in the city centre, and a wonderful buffet for breakfast. Places that we’ve told about aren’t the only ones to visit in Budapest during the Christmas time. 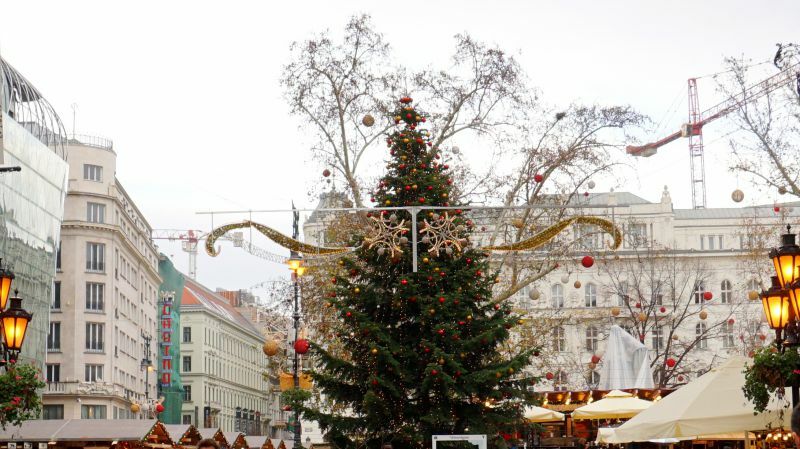 Visit this stunning city and figure out the best Christmas route through Budapest for yourself! Photos in the article: Oleksandr Safronov, Tetiana Smirnova specially for IGotoWorld.com.